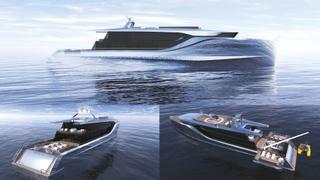 Concept Name: Laminar Nationality: Greek Education: University of Strathclyde Designer statement: This contemporary but intriguing yacht, has been named after her smooth curved and harmonised exterior lines. Her lines have been inspired by the laminar flow characteristics of a fluid. The key factor of the design is Ergonomics. Ergonomics involve functionality, safety, practicality, feasibility and privacy. 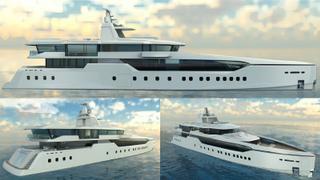 At the same time the yacht must be integrated with elegance and aesthetics. The result is an ergonomically consistent design. 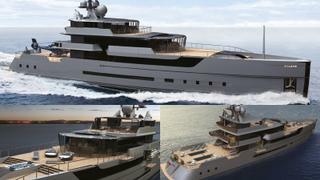 This 60 metre explorer yacht can cruise the 4 oceans and 7 seas with no compromise. Her spacious areas can accommodate up to 12 guests plus 16 crew and have been designed by paying significant attention to the flow of people around the yacht. Multipurpose areas have been implemented in order to store and derive the most efficient general arrangement. She is also able to store and carry a great variety of tenders, toys and vehicles as well as a helicopter. 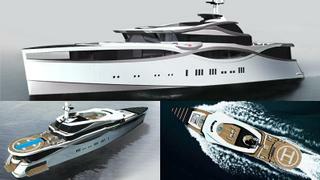 This contemporary but intriguing yacht, has been named after her smooth curved and harmonised exterior lines. Her lines have been inspired by the laminar flow characteristics of a fluid. The key factor of the design is Ergonomics. Ergonomics involve functionality, safety, practicality, feasibility and privacy. 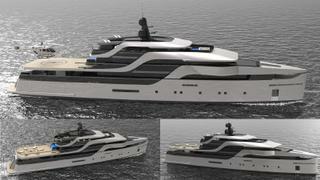 At the same time the yacht must be integrated with elegance and aesthetics. The result is an ergonomically consistent design. 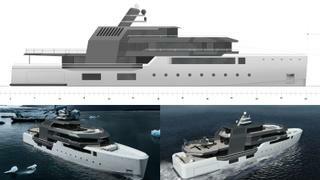 This 60 metre explorer yacht can cruise the 4 oceans and 7 seas with no compromise. Her spacious areas can accommodate up to 12 guests plus 16 crew and have been designed by paying significant attention to the flow of people around the yacht. Multipurpose areas have been implemented in order to store and derive the most efficient general arrangement. She is also able to store and carry a great variety of tenders, toys and vehicles as well as a helicopter. Concept Name: Sestante Nationality: Italian Education: Università di Cagliari Designer Statement: The design of Sestante is based on simple shapes to ensure an easy construction and rational arrangement of interior spaces. You can see for example that the upper deck is generated by the intersection between one rectangle and two octagons, which create the helipad, the living space and the bridge. The last one expands itself molding two winds to allow the people to see what happens around the yacht. 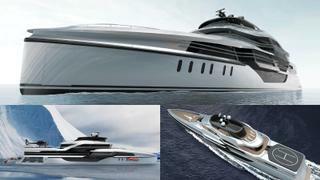 The stern of the yacht, as well as the bow, stay at a high level above the sea, to give a sense of safety to the users. The design of Sestante is based on simple shapes to ensure an easy construction and rational arrangement of interior spaces. You can see for example that the upper deck is generated by the intersection between one rectangle and two octagons, which create the helipad, the living space and the bridge. The last one expands itself molding two winds to allow the people to see what happens around the yacht. The stern of the yacht, as well as the bow, stay at a high level above the sea, to give a sense of safety to the users. Concept Name: Artemis Nationality: Cypriot Education: Istituto Europeo di Design Designer Statement: Artemis was designed to push the boundaries of transportation – to give the society’s elite an experience they will not find elsewhere. A play on transparencies between orientally-inspired wooden elements and tinted glass invites guests to indulge in once in a lifetime views, while large, open deck spaces with integrated pools provide the perfect opportunity to be at one with nature. The yacht is complete with a vast array of tenders and toys for the avid explorer, but sparing no comfort. Artemis was devised to be functional, sleek and modern, while adapting effortlessly for extraordinary adventures anywhere on the planet. Artemis was designed to push the boundaries of transportation – to give the society’s elite an experience they will not find elsewhere. A play on transparencies between orientally-inspired wooden elements and tinted glass invites guests to indulge in once in a lifetime views, while large, open deck spaces with integrated pools provide the perfect opportunity to be at one with nature. The yacht is complete with a vast array of tenders and toys for the avid explorer, but sparing no comfort. Artemis was devised to be functional, sleek and modern, while adapting effortlessly for extraordinary adventures anywhere on the planet. Concept Name: EX3 Nationality: Korean Education: Kyunghee University Designer Statement: Unlike other yachts, Explorer3 can experience various marine environments and it is a yacht that can boast strong durability in a dramatic environment. That the yacht was designed around these three key words. Exotic, Extreme and Experience. Unlike other yachts, Explorer3 can experience various marine environments and it is a yacht that can boast strong durability in a dramatic environment. That the yacht was designed around these three key words. Exotic, Extreme and Experience. Concept Name: Maestrale Nationality: Italian Education: University of Genoa Designer Statement: I wanted Maestrale to be yacht that can be used anywhere at any time. I placed several areas for the entertainment of guests, making cruising more enjoyable. The main deck becomes the ships meeting point as I have designed all the entertainment areas on this deck. When in warm climates, windows and balconies open to unite the yacht directly to the open air. The large interior space make Maestrale very voluminous, so I tried to make a design that is and aggressive, to reflect its modernity and strength. I wanted Maestrale to be yacht that can be used anywhere at any time. I placed several areas for the entertainment of guests, making cruising more enjoyable. The main deck becomes the ships meeting point as I have designed all the entertainment areas on this deck. When in warm climates, windows and balconies open to unite the yacht directly to the open air. The large interior space make Maestrale very voluminous, so I tried to make a design that is and aggressive, to reflect its modernity and strength. Concept Name: Galàna Nationality: Italian Education: Politecnico di Milano Designer Statement: The Owner of an Explorer is an explorer himself. That’s why Galàna is thought for traveling around the world making each moment unique. Her revolutionary soul is given by the dynamism of interiors and exteriors, from the full-opening Sundeck to the closable pool, from the sliding wall, that transforms the Lounge Salon in a Cinema, to the Cocktail-Bar and Wine-Cellar in the Main Salon. However the main feature is the glass: mainly with an incredible walk around cockpit that grants a great visibility, element repeated on the Sundeck, and with new rounded windows that light the full-beam Dining. Just Galàna. The Owner of an Explorer is an explorer himself. That’s why Galàna is thought for traveling around the world making each moment unique. Her revolutionary soul is given by the dynamism of interiors and exteriors, from the full-opening Sundeck to the closable pool, from the sliding wall, that transforms the Lounge Salon in a Cinema, to the Cocktail-Bar and Wine-Cellar in the Main Salon. However the main feature is the glass: mainly with an incredible walk around cockpit that grants a great visibility, element repeated on the Sundeck, and with new rounded windows that light the full-beam Dining. Just Galàna. Concept Name: Mirage Nationality:French Current employer:Freelance Designer Designer Statement: Nature, this wonder of the world, with its mysteries, its splendours, give the irresistible desire to discover it in all its facets. Thanks to its elegant silhouette, Mirage inspires a certain peace, and harmony with Nature by confusing itself with it. Thus, endowed with a certain mimicry by reﬂecting the images of the environment that it crosses, it will blend into the landscape and the exploration would become even more enriching. Thanks to Mirage, nature lovers would approach it as closely as possible to better understand and experience a real enchantment at every moment of their epic. Nature, this wonder of the world, with its mysteries, its splendours, give the irresistible desire to discover it in all its facets. Thanks to its elegant silhouette, Mirage inspires a certain peace, and harmony with Nature by confusing itself with it. Thus, endowed with a certain mimicry by reﬂecting the images of the environment that it crosses, it will blend into the landscape and the exploration would become even more enriching. Thanks to Mirage, nature lovers would approach it as closely as possible to better understand and experience a real enchantment at every moment of their epic. Concept Name: Atlas Nationality: Italian Current employer: Blugame Srl Viareggio Designer Statement: Atlas is developed from the idea of designing an explorer featuring a profile of a sleeker class of yacht. The forward volumes, typical of explorers, are stretched longitudinally thanks to superstructure extrusions that connect different decks. One particular feature is that the sun deck is divided into two separate areas; one for guests and another one for owners. This arrangement allows both of them to get inspired by the surroundings at the highest point of the yacht. Overall Atlas performs strong seaworthy appearance without compromising its dynamic design. 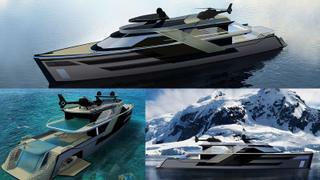 Atlas is developed from the idea of designing an explorer featuring a profile of a sleeker class of yacht. The forward volumes, typical of explorers, are stretched longitudinally thanks to superstructure extrusions that connect different decks. One particular feature is that the sun deck is divided into two separate areas; one for guests and another one for owners. This arrangement allows both of them to get inspired by the surroundings at the highest point of the yacht. Overall Atlas performs strong seaworthy appearance without compromising its dynamic design. 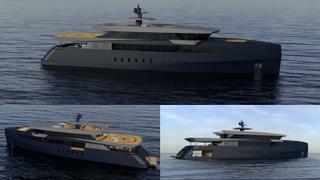 Concept Name: Ocean Collector Nationality: Chinese Current employer: Heysea Yacht Designer Statement: Ocean Collector is a comprehensive expedition yacht specially designed for private museum owner which is able to carry private submarines and helicopters, fulfilling owners longing for global travel and the quest to challenge deep sea exploration. With elevator directly to main deck, the 12 meter- helicopter deck on sun deck allows owner and his/hers guests to any floor as soon as the helicopter lands. The “Full Beam” designed idea in mater room and bay window in reading room meets the owner’s need to enjoy the scenery to his/her greatest satisfaction. Guests will pass a private gallery on the road to owner’s lounge, which is a great way of showing owner’s aesthetic appreciation. Ocean Collector is a comprehensive expedition yacht specially designed for private museum owner which is able to carry private submarines and helicopters, fulfilling owners longing for global travel and the quest to challenge deep sea exploration. With elevator directly to main deck, the 12 meter- helicopter deck on sun deck allows owner and his/hers guests to any floor as soon as the helicopter lands. The “Full Beam” designed idea in mater room and bay window in reading room meets the owner’s need to enjoy the scenery to his/her greatest satisfaction. Guests will pass a private gallery on the road to owner’s lounge, which is a great way of showing owner’s aesthetic appreciation.